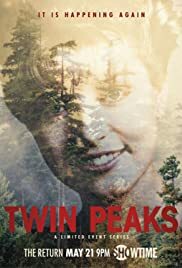 September 5, 2017 festreviews Mary Cox, television, Television Reviews, tv, TV Reviews, UncategorizedDavid Lynch, Kyle MacLachlan, Laura Dern, Mark Frost, Mary Cox, Matt Battaglia, television, TV Reviews, TWIN PEAKS – SEASON 03 – EPISODE 18, What is your name? Cooper and Diane drive 430 miles. Cooper attempts to help a troubled woman he believes to be Laura Palmer. aforementioned Richard and Linda are none other than Diane and Coop themselves. So much for my Richard Horne theory, right? the Owl Cave Ring, their reality is pulled apart and reshaped by an unseen force. Consider both the fates of Major Briggs and Phillip Jeffries. Unanswered questions: What the hell is up with Audrey? I have a theory that the Peaks world we know, where Cooper is still Cooper, and Laura is dead and wrapped in plastic, exists only in Audrey’s coma mind. I think that the symbol on the Owl Cave Ring is meant to reference the concept of either looping time or infinity, but what does that mean for Cooper? Who are Tina and Billy? The only good news about the ending of this episode is that it leaves open the possibility for a fourth season. This is highly unlikely, but hey, you never know what’s going to happen in another twenty-five years. Mulholland Drive and Lost Highway. That absolutely could be what’s going on here as well. you think Twin Peaks is really all about. We now (presumably) have all of the pieces of the puzzle, so it’s up to you to try and put it together to see the whole picture.